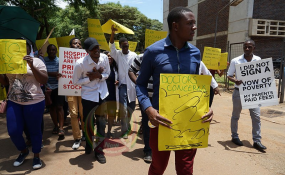 GOVERNMENT will not allow any demonstrations at hospitals by the striking junior doctors, Vice President Constantino Chiwenga has said. In a statement he released when he was Acting President on Tuesday, VP Chiwenga said the Government had met the majority of demands by the junior doctors. President Mnangagwa has cut short his leave to address the strike by the junior doctors which started on December 1 last year. They are demanding salaries in US dollars, a request Government has turned down. "Government will not allow any demonstrations at medical facilities whose purpose is to treat patients and ensure their full recovery. For the avoidance of doubt, Government will not remunerate any of its work-force in US dollars. Government does not print US dollars," said VP Chiwenga. He said foreign currency would be used to import drugs and to facilitate economic recovery in line with the Transitional Stabilisation Programme. "In particular, Government is disturbed by the fact that in spite of many concessions it made to the striking doctors, and the broad agreement reached on all but two issues, the striking health personnel continue to withhold their labour and negotiate in bad faith even though they are designated as an essential service under the Labour Act, and even though Government has bent over backwards to accommodate them," added VP Chiwenga. He said Government noted with concern that the labour issue had also assumed political overtones, including attempts by the striking health workers to appeal to constituencies with nothing to do with health delivery or their employment contracts. Government is now exploring other ways to ensure stability in the health sector as lasting measures are being worked out to normalise the situation. It also directed the Health Services Board (HSB) to take appropriate action against the striking health workers.